TV and radio presenter, Gloria Hunniford has been announced as the ambassador and public face of the National Care Home Open Day on the 20th June 2014. Run by a group of leading care providers and associations, this year’s National Care Home Open Day will have an international edge as South Africa and Australia join in for the first time. Care homes across the world will collectively open their doors to the public. Organisers of the event aim to connect care homes with their local communities, challenge misconceptions about residential care and show local people the excellent services at the heart of their community. Care homes will also be participating in an international Mexican wave, starting in Australia and coming all the way to the UK. Gloria Hunniford, a highly respected journalist and broadcaster, is a keen supporter of issues that affect older people. She aims to raise the profile of the event and encourage people from across the country to visit their local care home for the day. The campaign is aimed at all care homes across the country, both big and small, private providers and those run by local authorities. Gloria Hunniford is encouraging care homes to be as creative as possible with the activities they put on, and to encourage their local community to visit and perhaps even become volunteers in their local care home. “The National Care Home Open Day is a great opportunity for people to see for themselves the quality of the care services in their neighbourhoods, to make informed assessments of the range of what is available and the standard of care. 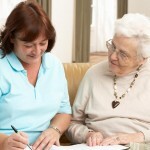 “Care homes and their residents are a very important but sometimes overlooked part of our society. The National Care Home Open Day will help strengthen the relationships between care home residents, staff and their next door neighbours. It may even encourage a few people to think about volunteering to do something during the rest of the year to support and befriend residents in local care homes.